Attach your home router and modem networking equipment. Stay connected to the internet hours after safely shutting down your PC. Provides 9 outlets total (7 backup outlets and 2 surge outlets). The new Back-UPS BN900M provides instant battery power to your critical electronic devices when the power goes out, keeping you connected and available both personally and professionally. The refreshed design provides longer runtime during outages for both heavy (desktop PC, television) and lighter (home network) connected loads; and has more battery backup outlets (6) than ever before. Power and protect all of your critical electronics while maintaining your internet connection during prolonged power outages. The new and improved APC Back-UPS BN900M keeps you connected to what matters the most by providing more runtime and battery backup outlets than ever before. The BN900M is designed to maximize runtime for devices such as multiple PCs and television equipment that consume high amounts of power. After these devices are safely shut down, the BN900M continues to run low power loads (such as home networking equipment) for hours during extended outages. The BN900M features a total of nine power outlets, all of which shield your devices against dangerous surges and spikes in voltage. Six of these are UPS battery backup outlets that provide instant power to connected devices when there is an outage. For added convenience, this UPS also offers 2 transformer block spaced outlets, so you can connect bulky transformers without covering other outlets. APC PowerChute Personal Edition power and energy management software prevents data corruption by automatically saving files and shutting down your system in an extended power outage or low-battery condition. PowerChute monitors and displays energy usage and reduces costs via customized energy management planning. Simply connect the USB cable that's included with your UPS to your computer to easily use the software. More Runtime: Power your critical electronics for longer than ever before; the BN900M is capable of powering your wireless networking equipment (router and modem) for up to 4 hours after safely shutting down high powered equipment. 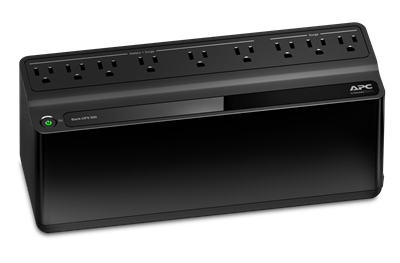 More Battery Backup Outlets: Power more of your critical electronics during a power outage; the BN900M has enough outlets to power up to 6 devices at once. Added Convenience: Wide outlet spacing allows you to connect bulky transformers without covering other outlets. Smaller and Lighter: The new BN900M is smaller and lighter than previous models, allowing you to easily relocate and position your UPS in any environment.